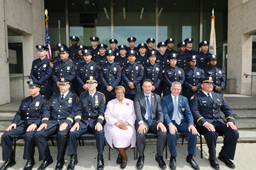 The City of Paterson is a NEW JERSEY CIVIL SERVICE COMMISSION - LAW ENFORCEMENT jurisdiction, therefore, all phases of the recruitment, selection, and hiring process for entry level law enforcement positions conform to the rules and regulations established by the New Jersey Civil Service Commission and City of Paterson Code. Entry-level examinations are conducted exclusively by the New Jersey Civil Service Commission once every two years. Entry level testing is tentatively scheduled for Fall 2018. Check the NEW JERSEY CIVIL SERVICE COMMISSION - LAW ENFORCEMENT website for more information. For "Civilian Positions" contact the Personnel Department. The City of Paterson is an Equal Opportunity Employer.